SHAWNEE COUNTY — Law enforcement authorities are investigating a Kansas felon on new charges after an arrest. Just after 8:30a.m. 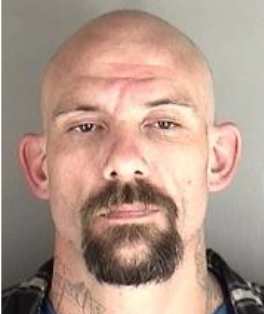 Thursday, officers with the Shawnee County Sheriff’s Office Fugitive Warrants Unit attempted to apprehend Joshua A. Smith, 36, on two felony warrants, both for Domestic Battery with Reckless Bodily Harm, according to Deputy Shayna Anderson. Smith was contacted in the 400 block of NE Green where he took off running through backyards and jumping fences. Officers gave pursuit on foot and lost Smith near Shunga Creek. Officers from the Shawnee County Sheriff’s Office, Topeka Police Department, Kansas Highway Patrol, and KDOC Parole Enforcement set up an extensive perimeter around the area. Deputies utilizing a Sheriff’s Office K-9 were able to pick up Smith’s trail in Shunga Creek and locate him in a drainage culvert near the 2600 block of NE Laurent St. He was taken into custody without further incident, according to Anderson. Deputies booked Smith into the Shawnee County Department of Corrections on the two felony warrants as well as an additional charge of Felony Interference. He has previous convictions for criminal threat and aggravated intimidation of a witness or victim, according to the Kansas Department of Corrections.